Town defender Dan Potts thought that even when a man down against Notts County on Saturday, his side deserved to come away with the three points. 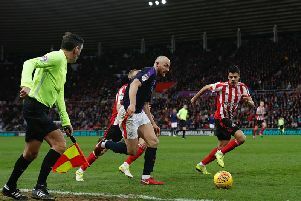 The full back and his team-mates had to eventually make do with just one in a goalless draw at Meadow Lane, despite playing for 30 minutes with 10 men, after striker Danny Hylton was sent off. We still had the chances, especially at the end and that’s credit to the lads out there. They could have won it, Pelly-Ruddock Mpanzu denied by a desperate block, while Harry Cornick, Elliot Lee, Jack Stacey and James Collins all went close, as Potts said: “I thought even when we went down to 10 men, nothing really changed. “We still had the chances, especially at the end and that’s credit to the lads out there. “We’ve gone down to 10 men a few times this year and every time we have, we’ve managed the game well and been able to grind out results. On the decision to hand Hylton red by referee Darren Handley, his first booking for dissent and the second for an aerial challenge on Shaun Brisley, Potts continued: “ I thought it was harsh. I was on the other side of the pitch and their players were surrounding the ref and the reaction they gave, it might have swayed the ref’s mind. Boss Nathan Jones revealed he knew in advance that his side were going to produce a fine performance, even with nothing riding on the game. He added: “I pulled them in training on Friday and said, ‘that’s why you’ve been promoted’. “Because the training session was as competitive as any at Christmas, any in August, in December, any time. “It was so competitive and that’s a credit to the environment, the culture and a credit to the individuals’ motivation to keep doing well. “It would have been real easy to come here with a festival atmosphere, but we didn’t and it was as professional performance as we could have put on.